As if I'm not busy enough I volunteered to coach my son's kindergarten soccer team. I was really nervous at first, but after coaching a few practices and my first game I'm pretty confident I can handle it. And I just adore the kids. They are so enthusiastic. A few weeks ago I came across this on Pinterest. I thought it was great, so I decided to try it out with soccer balls. I purchased these one inch images from IKJewelryParty on Etsy for only $.59! After printing them on regular printer paper I learned that it is too thin and the paper glaze will cause it to tear. Make sure you use card stock! Because I didn't feel like running to the store for card stock I used a sheet of soccer ball scrapbook paper from Michael's that I already had handy. I still plan on using the soccer images for cupcake toppers for the end of the season party. 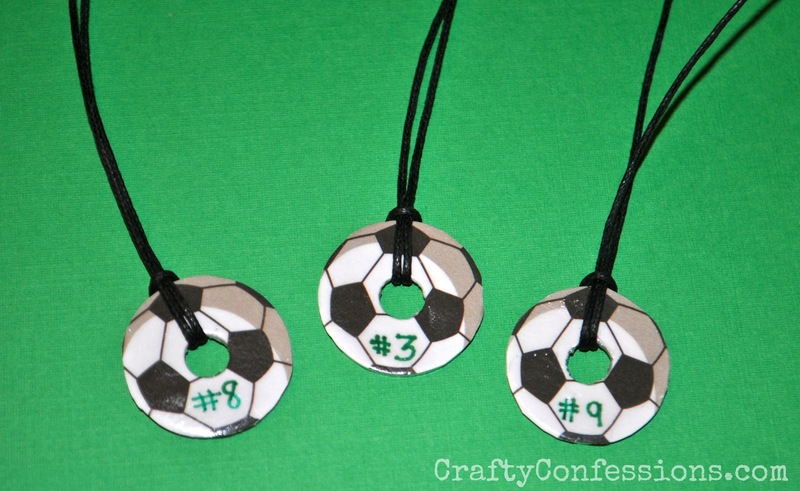 To make the necklaces I cut out the soccer balls and adhered them to 1 inch washers with Paper Glaze. Next, I wrote each child's jersey number on the balls with a fine tipped Sharpie, and carefully removed the middle with a needle and an Exacto knife. Finally I covered the pendants with a thick layer of Paper Glaze. 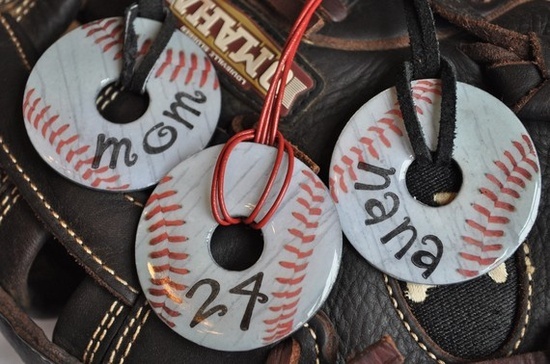 This is a great, inexpensive team gift and can be made with any type of ball. 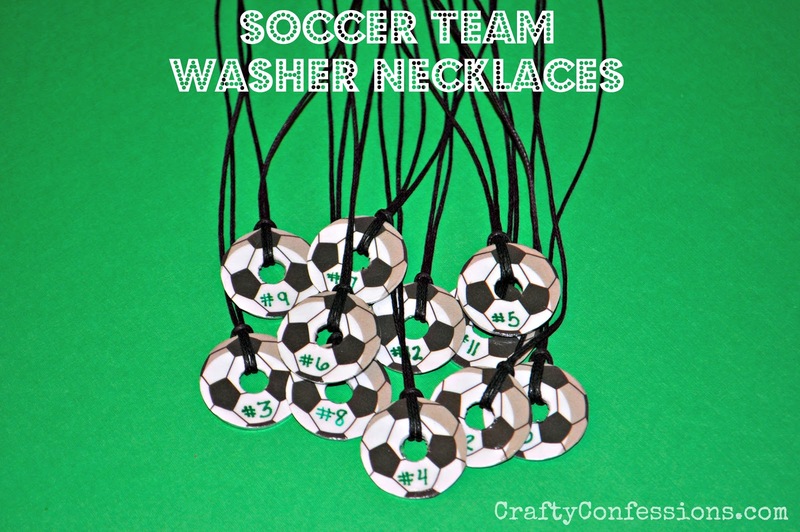 Including the soccer images, washers, and necklace cord I only spent around $4 on this project. I can't wait to give them to my soccer munchkins at the next game! Linking up to THESE parties. What a cute project!! I'm sure those little players of yours will love them! We'll be featuring this over at Someday Crafts tomorrow. We'd love it if you'd stop by and check it out! What a great idea!!! I will be pinning this and following you for sure! 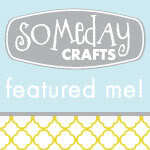 that is so cute, i saw your feature on someday crafts and had to come over and tell you how neat i think those are! What a cute idea. I am following you from Share it Saturdays. Great idea!! I love these. Thanks for linking to Share It Saturday this week. what did you use for the necklace? I used necklace cord from Michaels. They have it in the jewelry supplies. What type of paper glaze? Để những bữa cơm gia đình thu hút hơn, núi kéo được các nha dep thành viên trong gia đình sớm trở về nhà sau mỗi ngày, thì một phòng ăn sang trọng thiet ke nha pho và đẹp mắt sẽ tăng thêm tinh thần vui vẻ, hứng khởi thiet ke biet thu cho những bữa cơm gia đình. Việc bố trí hiệu ứng ánh sáng cũng như trang trí màu sắc thiet ke nha dep còn góp phần kích thích vị giác đánh thức thị giác của con người. Vì vậy không phải ngẫu nhiên mà nội thất phòng ăn thường được bố trí nằm gần phòng khách hay những nơi có nhiều người qua lại. celebrate Valentine’s Day.”Replica watches UK Including Geneva, Switzerland, the month of means and salon international Rolex Daytona , the 16 Replica handbags brands to their support for the latest handbag replica . Here, I am from a look at some of this year’s new show at the Replica Watches . MONTBLANC ORBIS TERRARUM Worldtimers shown the time zone of the 24, the spatial resolution is too small, is too many other test information. And Orbis Terrarum.Mont Blanc is untangles the mess. شركة تنظيف سجاد بالمدينة المنورة تعمل على توفير أحدث الأجهزة والتقنيات الحديثة وخاصة تقنية البخار التي تعمل على القيام بتنظيف السجاد دون استخدام المياه وذلك عن طريق وضع السجاد في تلك الألة المتطورة وتخرج نظيفة وزاهية الألوان، تعمل تلك الألات على المحافظة على الأقمشة ورونقها، وكذلك الألوان. يجب علينا مكافحة الحمام بالمنازل و خاصة أن الحمام ينتشر بصورة مكثفة في هذه المنطقة و خصوصاً الأماكن الشاسعة و أسطح المدارس والشركات و الأبنية الحكومية لذا تقدم لك شركة مكافحة الحمام بالمدينة المنورة كافة الإمكانيات التي تساعد على التخلص منها ومكافحها و طرد الحمام من جميع المنازل و الأبنية حفاظاً منا على الراحة و الهدوء و نظافة المكان من مخلفات الحمام وتقوم بذلك من خلال فريق عمل مميز تم تدريبهم على أعلى مستوى و لديهم خبرة الواسعة لمكافحة تلك الطيور المزعجة وتقوم بذلك بأحدث الطرق الأجهزة المتطورة وكل هذا بأسعار مميزة و مخفضة من أجل جذب العملاء لتعاملهم مع شركة مكافحة الحمام بالمدينة المنورة. There is one blue? switch attached to wires coming out of the transmission which can be safely taken apart and its connectors cleaned. Follow these wires and you'll come to the pulse generator, a silver device, also on the left of the car. beard shirt (MORE). And it's posturing that specifically aims to hurt. When you see unique t shirts a shirt that reads, "If You Don't Practice, You Don't Deserve to Dream," you tend to get mad or disappointed at the direction this nation is going. Are we as a nation so angry with each other that trash talk has become the way we communicate? I know it's the way ugly christmas shirts people talk to each other on Jenny Jones and Geraldo, but can't the rest of us show a little more dignity than that? Sure it's an election year, but can't we be a little nicer than to announce on our T shirt, "I Can Taste Victory In My Mouth and Smell Fear On Your Breath"? Isn't that a little too PERSONAL.